I've been waiting for a decent bit of cold weather to set the mood for this story. At the end of the story, the bike I was then using gets a mention. It was a 650cc BMW Funduro (a stupid name, I know). Don't take its glowing recommendation too seriously because I changed my mind on it fairly quickly as you will see in the next bike related post. It was downright dangerous! I have always enjoyed working on motorcycles, so usually buy something fairly cheap, and then fix it up to my requirements. Since anything on two wheels is inherently unstable, I don't believe that owning a bike that you cannot afford to fall off is a practical proposition. 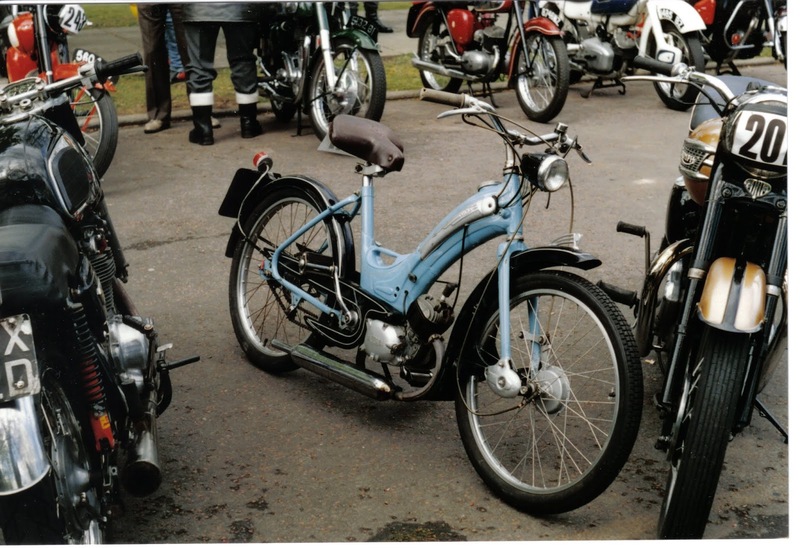 This story was originally published at: http://www.realclassic.co.uk/opinionfiles/sparking-honda-ht-leads.html. You will find the first 3 of my Paddock stories further down this page. 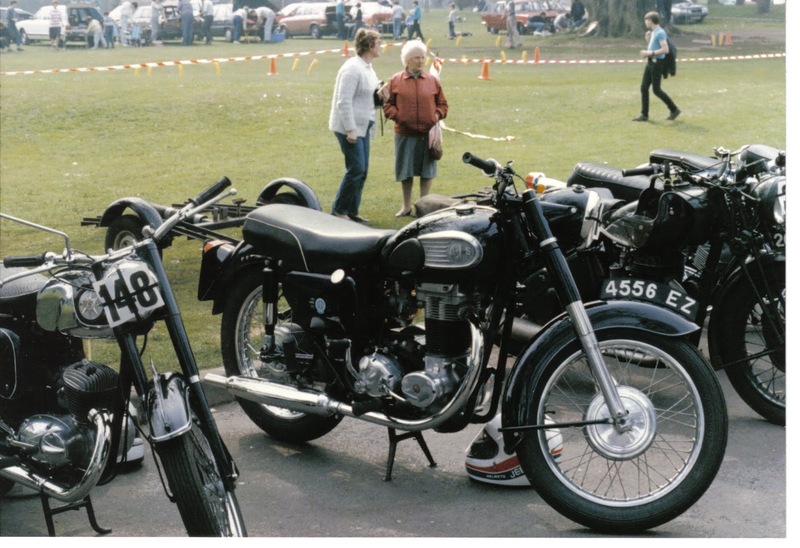 There weren’t many in the Paddock who had even a remote interest in British bikes. Come to think of it, in my early days there, even owning a four stroke was demeaned as a lardy admission of racing un-competitiveness. Two strokes ruled, and by that I don’t mean BSA Bantams! And yet there were a few of us who, spurred on by parental tales of daring deeds done during the dark and decadent days of their own youth, yearned to prove ourselves by mastering obscure starting rituals, quirky mechanicals and the black arts that would cure vibration of tectonic proportions and make ancient alloy cases gleaming and continent. My own fathers favourite tale told of him buying an Ariel for a few shillings from a farmer who couldn’t keep oil in it, and in who’s ownership it kept seizing. To preserve the farmers’ dignity, and to hide his own mechanical alchemy, he wheeled the bike to the end of the lane after buying it before removing the oil lines and replacing them in the opposite order. With the bike now sucking oil from the tank rather than air from the return line, he then rode off into the sunset; happy ever after. These were large boots to fill when at 14 I spent my hard earned pocket money on the wreckage of what had once been a 1947 Norton ES2. It had been abused as a field bike and more of its parts were missing than were actually there, however pulling it apart and putting it back together again was much more fun than Lego had ever been, and it even taught me a little about the valves, rockers, cams and cranks that make up a motorcycle. Its engine also looked impossibly tall and handsome, as beautifully prehistoric as the still sharp edge of a flint napped axe head, yet promising all the earthy power of the Flying Scotsman. It, and the Bruce Mainsmith books that I bought to learn about it filled my juvenile head with Norton’s. Nothing else came close. 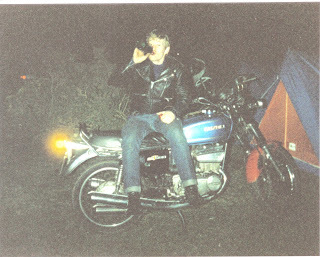 And then I turned 16 and was let loose upon the world onboard my trusty Fizzie, but I’ve told you about that. The practicalities of transport and new teenage horizons soon left all those ancient relics as dreams only; gone but not forgotten. A procession of 250 and 350 Honda’s came to broaden my motorcycling experience. I even survived a brief and ultimately doomed spell on board a GT750 Suzuki with virtually no brakes. Tales of the legendary handling of Norton’s looked particularly welcoming after that one, and so I bought a Bonneville (quite what the links were supposed to be between those two makers I have no idea; it must have seemed sensible at the time). I didn’t buy the first Brit I looked at you understand, that would only have been impetuously stupid. It was the second. The first could have been any one of 5 or 6 ex-police Saints that were for sale in a car dealership in Ballyclare. They were all in need of one or two small things before they could have been MOT’ed, but as the cooking version of the breed and marred as they were with their great barn door fairings, I foolishly passed them over. Instead the wonderfully eccentric TT Tommy, a roving hippy like ex-member of a French Hells Angels chapter (There could be a series of stories in TT’s exploits alone! ), put me on the track of a Bonneville which lay at the back of a bike shop shed close to Belfast Zoo. It was from 1965, seized and ratty and with a few parts missing. I was hooked, the kudos of the Bonneville name and an aftermarket Tickle, twin leading shoe front brake conquered all, so I bought it. Needless to say my project soon turned into a gargantuan money pit where everything took longer and cost twice as much as expected. I soon tired of walking everywhere and hanging on to some lunatic’s pillion seat during Sunday runs so my thoughts turned to getting another bike on the road to tide me over until the Bonneville was released onto an unsuspecting world. The piles of K4 Honda twin parts in my garage were soon combined with a frame that was quite literally dug out of a garden to produce a ratty yet functioning bike. It’s ripped seat cover was ‘fixed’ with a plastic bag tucked under the seat strap. This innovation had the additional benefit that when the bike was left in the rain, the bag could be folded back to keep both the front and rear seat covered and dry (patent pending). Its rear light too was unusual in that it came from a scrapped lorry. Initially there was an indicator, a reflector and the tail light in a huge rubber unit. Stan the knife came to the rescue and soon trimmed that down to the required parts. A patch of moss growing on the frame from its period of underground storage soon disappeared after the slight leak caused by using a second hand alternator gasket worked its magic. It kept the chain lubricated too (patent pending). It wasn’t all bad. I had managed to liberate a few good bits from my boxes of spares, a Cibie, halogen headlight probably being the most useful of them. Meanwhile a seahorse and a selection of plastic knickknacks stuck to the headlight and front guard reinforced the bikes joke status. It was ugly, so very, very ugly, but at least it was serviceable. 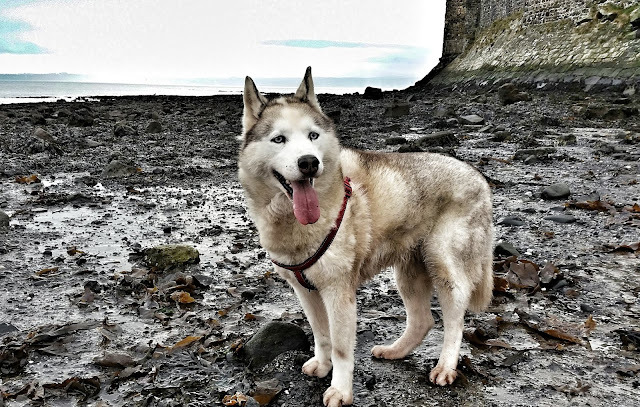 Boomer and I were then on an electronics repair course based in Dundonald, and to save a little towards weekend entertainments we alternated the journey on one another’s bikes each day. Both were scrappers and were run on a shoestring so we suffered our share of punctures and mechanical gremlins. Since most of these seemed to happen in winter rain and mist as we made our way over the Hollywood hills past the local reservoir, we soon christened the area ‘the Ballysallagh Triangle”. I can’t remember why, but I was on my own on the course one Friday, and since we got out early I decided to ignore the snow that had been falling since the day before to go to Spence’s, one of the few remaining ex Triumph dealers, based on the far side of Belfast. All went well until I was a few miles short of my destination when the Honda began to misfire. Worse yet, when I pulled the clutch in as I tried to move to the side of the road to check the problem out, my snow soaked gloves transmitted a huge electric shock through me. The problem was instantly clear. Someone, sometime had cut the HT lead on one of the Honda’s coils. I had used it because I had no other spares, and since the HT leads were sealed into the coil I had to join a new length of HT lead to the old one with one of those horrible screw on connectors in a Bakelite insulator. Despite loads of insulating tape around this joint, miles of road slush was obviously getting in somewhere. Given the choice of continuing to a place where I could get some fresh insulating tape and a chance to dry out the coil, or turning round and trying to struggle home I went on. 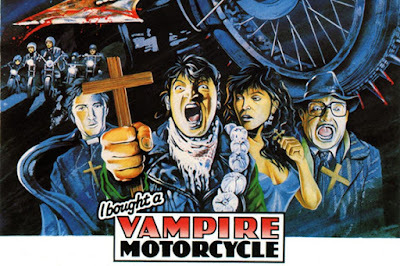 It was the most appalling ride of my life. 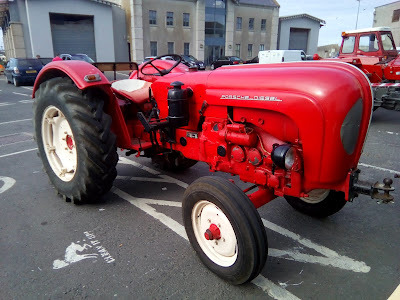 At roundabouts and traffic lights I timed my approach as best I could and changed gear without the clutch except when stopping, but in a city where the Friday exodus was getting into full swing, the Honda had become more of a defibrillator than transport. The drag of one cylinder that wasn’t playing the game meant I was creeping along in the snowy gutter as cars swept past and I was getting wetter and colder every minute. By the time I reached Spence’s, (long since converted into a filling station but still with a few shelves of bike parts), I was a shivering wreck. Still, they must have felt sorry for me because no one complained as I stood under the entrance heater getting strange looks from their petrol customers as I tried to thaw out. Eventually, when my fingers worked again, I dried and taped the HT lead as best as I could under the meagre cover provided for the petrol pumps. My repair didn’t last though, and five or six miles down the road I was back in a creeping, freezing, electric shocking hell. I don’t know how long that journey took me. It seemed endless at the time. Certainly that whole day was not worth the few cables that I had managed to find amongst Spence’s left over stock. By the time I got home I must have been suffering from hypothermia. I remember shivering so violently that I had real trouble getting my house key out of the pocket of my Belstaff jacket and that I dropped it many times when attempting to get the key into the lock. 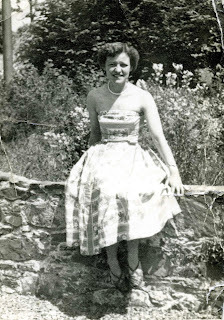 I was still there trying to get that damned door open when my mother fortuitously arrived home from her work and her nurses training took over. All this came to mind as I waited for the lights to change the other day on my way home from work during a shower of sleet. The traffic lights were in the same location where I had suffered all those years ago, but this time on my winter bike I was snug and dry inside my Cordura suit and my hands were toasting warmly in handlebar muffs as I held onto my heated grips. Luxury. The bike itself is a soon to be 21 year old 650cc single, a BMW F650 Funduro. It was bought and fixed from a wreck for less than a decent BSA Bantam would cost these days, and although it is proportionally older (the Bonneville was about 13 when I bought it), and lived outside for most of its life, the BMW was still in much better nick than the Bonneville was when I bought it. If I needed those cables these days there would be no point in looking for them in Belfast. Instead I would simply take one look at the weather and switch on my computer rather than venturing out on such a miserable day. So much easier than all those phone calls and cheques in the post used to be. And so it struck me: not everything in ‘the good old days’ was better. I never did finish that Bonneville, instead I part exed it to a guy for a 350 AJS and enough cash to hitch hike around Europe for a while. TT Tommy had some good but very dubious money making tips for this trip should I ever have needed them! The AJ, although it must be sacrilege to say this in the virtual presence of the almighty FW, was of no real interest to me. It was too heavy, too slow and too ugly, totally devoid of the Bonneville’s sporting pretentions. In due course it too went to make space in the garage and fund other bikes. In May 1989, I took the Black Bomber than I was running then to a celebration of the old Ards TT races along with a friend to whom I had loaned a little Victoria moped that I had recently fixed up. 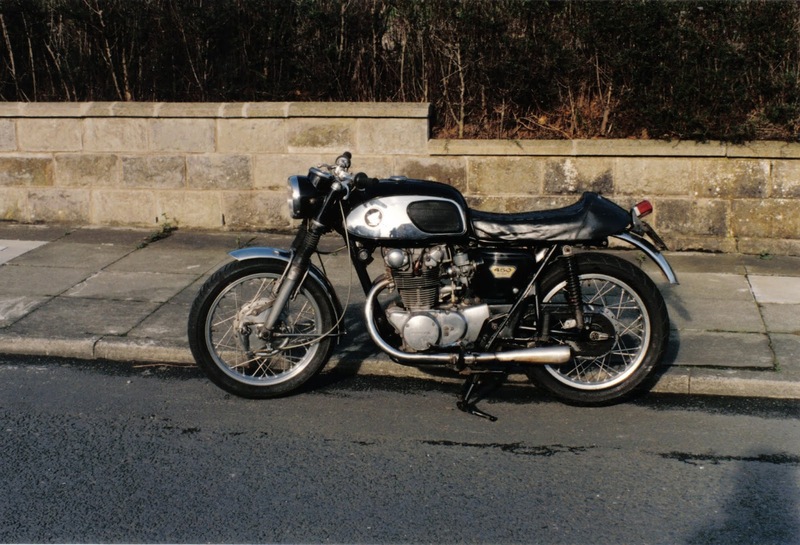 The Victoria had come to me as a freebee, along with the Norton ES2 mentioned at the start of this article but had been dormant for years afterwards. 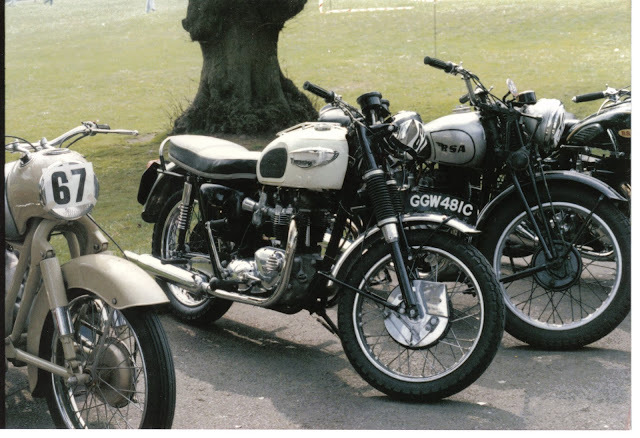 Strangely, both the Bonneville and the AJS that I had once owned were there as well. It was the first time I had seen either of them since selling them.